VCAP-DCD/DCA Home Lab – What should it look like? – Domain controller VM running 2k8R2, with DNS and DHCP roles. Also had the Solarwinds free FTP server for Autodeploy. This VM had 1 vCPU, 2GB vRAM and 20GB disk. With this it ran ok, didn’t need to be any bigger. – vCenter Server Appliance with 2vCPU, 4GB vRAM and default disk sizes. I found with any less RAM I had issues with the database and Autodeploy wouldn’t start properly. – 3 x ESXi 5 VM’s, each with 2vCPU, 3GB vRAM and 10GB disk. This was enough to test building ESXi hosts with Autodeploy, attach them to vCenter and manage them. I was able to test HA and vMotion among other features. The only nested VM I used was the Nostalgia OVA, I was able to play Prince of Persia during a vMotion, cool! This pretty much summed up my lab during the study. However, now that I’m studying for the VCAP exams I’m trying to work out the best use of my limited host resources (I have upgraded my RAM to 32GB though). The question is, what VM’s are the most appropriate and how many? 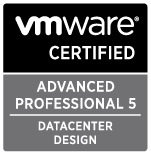 At the moment I only have a Domain Controller, vCenter (full install with UM, etc) and four ESXi guests (three ESXi 5 and one ESXi 4 – I want to test upgrading to 5 using Update Manager). I thought I’d stand up some VM’s to play with vShield Zones, View, SRM, etc but there are so many products to choose from. Obviously these all won’t be covered by the VCAP exams but I still see benefit in being familiar with them.